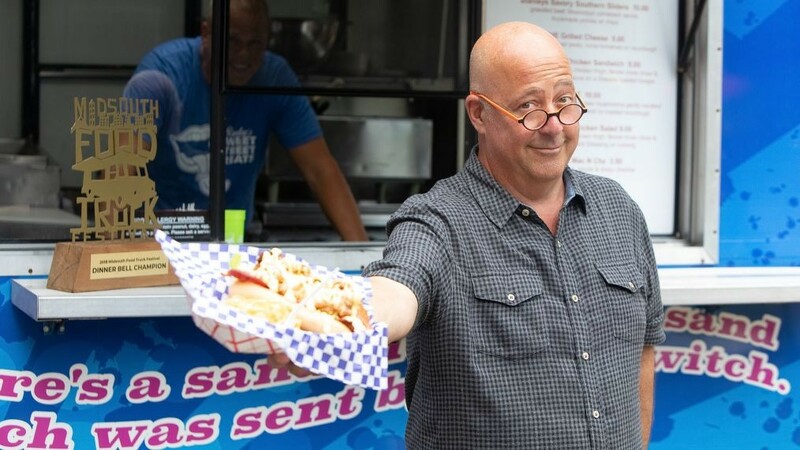 While Salt Lake City’s food offerings might not have been weird enough to land on an episode of Bizarre Foods, globetrotting chef and food personality Andrew Zimmern made a trip to our fair metropolis for his new Food Network show, Big Food Truck Tip. The show follows Zimmern as he visits various American cities to sample three of their finest food-truck representatives. On each episode, Zimmern decides which of the three trucks is worthy of a $10,000 tip to help their operation keep on truckin’. In preparation for the Salt Lake City episode—which airs on Oct. 3 at 8 p.m.—we scheduled a phone interview with Zimmern to talk about the cultural significance of food trucks, along with the three trucks that will be featured on Big Food Truck Tip. City Weekly: Tell us a little bit about how you got involved with the show. Andrew Zimmern: I had done All Star Academy for a season on Food Network a couple years ago. They came to me with the idea, and I loved it. My one caveat was that I tell stories about culture, like food and its relationship to people, so I said as long as we can maintain that totem to the show, I’m all in. How is Big Food Truck Tip unique compared to similar Food Network shows? Rather than being a Food Network competition show that simply relies on quality of food, I take the criteria of the best food that I eat and put it through the prism of how is this money going to affect these people, how inspiring are their stories, and what they are going to do with that money? Are they going to enrich their communities by getting the money? So it’s got a little bit of my own sociocultural bias brought in there, but it’s a super-exciting show. My production company, Intuitive Content, produces the show, so we have the ability to make something that is really going to amaze people when they see it. I’m so proud of how beautiful the show looks. I understand that modern day food trucks are part of a fairly extensive cultural heritage—does that mean they’re not just a fad or trend? There are a lot of myths that people buy into, like food trucks are a trend—they’re not. As long as human beings have been eating food communally, food has been mobile. This is a 40,000-year-old trend, which makes it not a trend. That’s No. 1. No. 2, because food trucks represent the least-expensive way for entrepreneurs to enter the food game in a serious way, it is a hardscrabble group of people working on very low margins, but who are really passionate about food, and have used mobile vending as a way to get into the business. That means it’s ideal for young entrepreneurs, single moms, people coming out of jails and institutions, and anyone who has come through some really hard situations in their lives. The average person can’t go out and raise $2 million and open a restaurant. The average person can’t go out and raise a couple hundred thousand dollars and open a simple restaurant. A food truck, or food cart in some cities, can be done on the cheap. We met a lot of people, immigrants for example, who worked two jobs for 20 years and saved money who could take their passion and own their own business. You see a lot of examples of the American dream being played out in front of you, and I think that’s one of the magical things about food trucks. Though most of the country doesn’t know it, Utah’s got a lot of diversity when it comes to food. Were you able to capture that with the trucks that you visited? I think you hit the nail on the head, which is diversity. We don’t see a lot of diversity in other parts of our restaurant community because people don’t tend to engage in the diverse nature of restaurants. Because food trucks are mobile and can travel to where the customers are, people are willing to explore different ethnic foods and are willing to explore different types of cuisine, which is really exciting. I visited three trucks when we visited Salt Lake City for the show. We went to Nella, which was a pizzeria opened by an Argentine entrepreneur; we went to Salty Pineapple which is a food truck owned by two young women, and we went to Havana Eats which is a food truck owned by a young husband and wife that have done this thing on a shoestring, and all three were absolutely exceptional. Our biggest problem on the show was deciding who would get the big tip. We give everyone a very large tip, but the big tip, which is $10,000, only goes to one of the three trucks. If I remember correctly, there are around 120 to 140 food trucks that are licensed in Salt Lake City. That means that there were a lot of trucks that we couldn’t feature. It’s hard to leave that much talent on the table, but I’m glad we were able to do the three that we did. What’s different about our food trucks compared to the other cities you’ve visited? Salt Lake City has a really unique environment geographically, so from a weather standpoint, the food-truck season is fairly well extended. That provides a lot more months of income versus places like Minneapolis, where I’m from. I’ve visited Salt Lake City many times over the last 10 years, and people think that states like Utah and states like Minnesota are just extremely lily white, which is certainly true in both cases when you get outside of the major cities. However, inside the cities themselves, it’s much more diverse and much more entertaining than people give it credit for. People are always surprised when we tell them we went to Salt Lake City and tell them that no, not every food truck serves funeral potatoes. People are always practicing contempt prior to investigation when it comes to anything, and I love the myth-busting of showing folks how really diverse and how entertaining and fun the scene is there. Thanks for doing that—we need more myth busting around here. Other than helping out local food trucks, what are you hoping your show does for its audience? I hope the show is fun and entertaining for people. There are a lot of people who come home from work, flip on Food Network and want to be entertained. They’ve had a hard day and want to be taken away somewhere. So that’s No. 1—it’s got to be fun and it’s got to be appealing to people. The second thing I like to do is to have people learn at least one thing after watching. There has to be a takeaway. When people ask what I do for a living, I call it adventure learning. Remaining teachable is a really important way to operate in life, so I’m always learning things by studying people and culture.